our expertise is in transportation logistics. Corsair Logistics is a leading provider of technology-enabled business process outsourcing, serving the transportation and logistics needs of our clients. Corsair Logistics is a leading provider of technology-enabled business process outsourcing, serving the transportation and logistics needs of our clients. Our proprietary web-based technology, dedicated service teams and robust procurement power enables our clients to see significant transportation savings while receiving best-in-class service. Corsair also gives our Clients the option of administration savings by utilization of audit and voucher system. 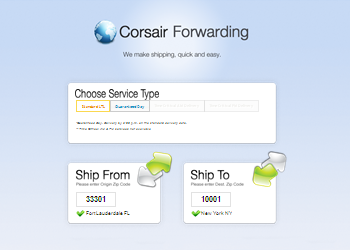 Corsair also maintains Intra-net websites for all clients to use as a Transportation portal to insure proper shipping methods by the clients’ staffs. This innovative technology can also be used for planning and cost savings ideas. Corsair’s Ad-Hoc Logistic Reports can be tailored specifically for different strategic groups within your corporation. These reports are real time and are updated hourly.